Copyright: © 2018 Nikolov V, et al. This is an open-access article distributed under the terms of the Creative Commons Attribution License, which permits unrestricted use, distribution, and reproduction in any medium, provided the original author and source are credited. Oncological treatment consists of the application of radiation therapy and chemotherapy. Recently, Temodal has been frequently used to prolong the tumor recurrence period . In the case of non-application of oncological treatment, the tumor recurs within a few months. The application of oncological treatment has enabled the prolongation of patients’ lives for several months, in some cases even for several years . Combined arterial spin labeling and diffusion tensor imaging metrics of enhanced lesion and related edema are valuable noninvasive tools in differentiating residual/recurrent gliomas from postradiation changes . The type of surgical intervention with respect to the length of survival was compared revealing that those patients with a maximum tumor reduction have a better prognosis than those in whom only a biopsy was performed . Only surgical treatments, with maximum tumor reduction but without the follow-up oncological treatment, do not yield satisfactory results, as tumor recurrence occurs within a few months. A 40-year-old patient due to the development of discrete left-sided weakness, resulting from a normal health condition, a brain CT scan was done showing the presence of a tumor change front-temporally right (Figure 1). 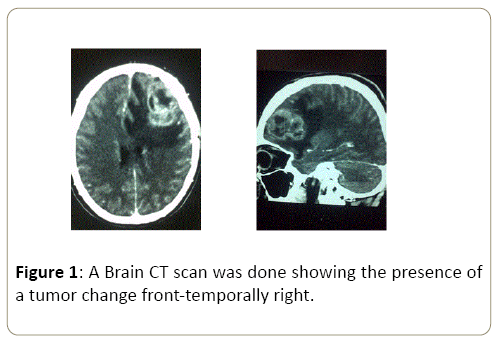 Figure 1: A Brain CT scan was done showing the presence of a tumor change front-temporally right. Admitted at the Neurosurgery Clinic on 17 March 2014, brain MRI performed. Prepared for the surgery that was performed on 20 March 2014. Postoperative course normal, neurology in regression. Control brain CT scan dated 24 March 2014 showed no signs of residue (Figure 2). 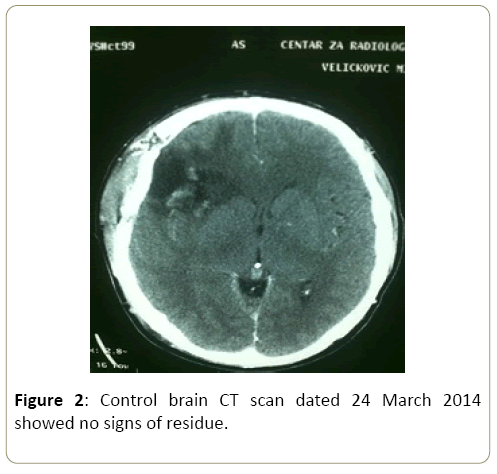 Figure 2: Control brain CT scan dated 24 March 2014 showed no signs of residue. PH finding: glioblastoma multiform. The patient refuses oncological treatment. On 20 November 2016, a brain CT scan was done showing the relapse of the described change (Figure 3). 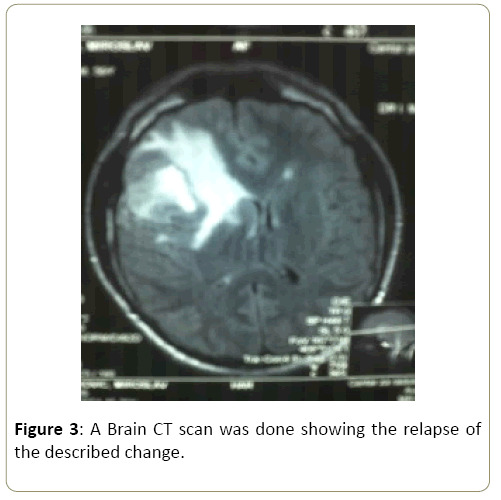 Figure 3: A Brain CT scan was done showing the relapse of the described change. The patient was prepared and had a surgery on 25 June 2016. Postoperative condition normal, without neurology. Control brain CT scan done on 27 June 2016, no residue (Figure 4). 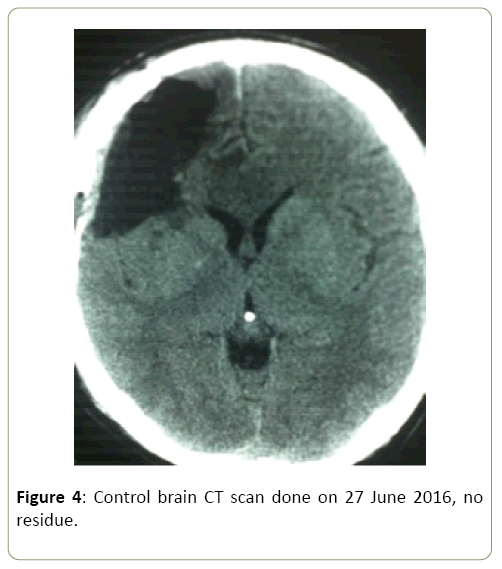 Figure 4: Control brain CT scan done on 27 June 2016, no residue. 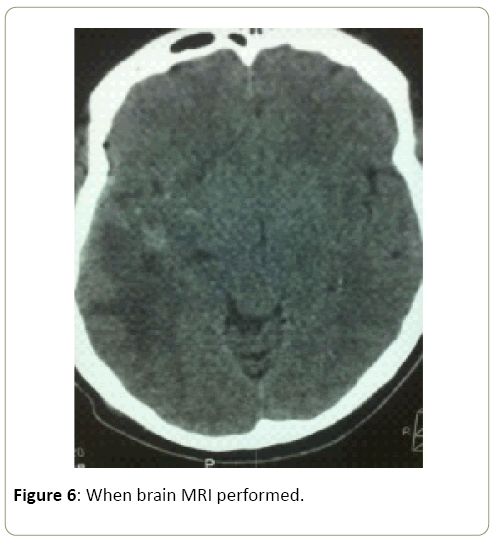 A 52-year-old patient due to the development of left-sided weakness, a brain CT scan was done showing the presence of a tumor change temporally right (Figure 5). 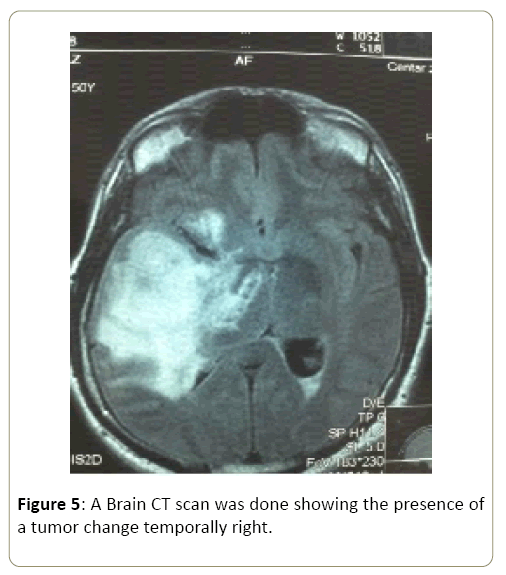 Figure 5: A Brain CT scan was done showing the presence of a tumor change temporally right. Admitted at the Neurosurgery Clinic on 15 May 2016 when brain MRI performed (Figure 6). Figure 6: When brain MRI performed. He was prepared for the surgery that was performed on 20 May 2016. Postoperative condition stable, neurology in regression. Control brain CT scan dated 26 May 2016 showed no signs of residue (Figure 7). 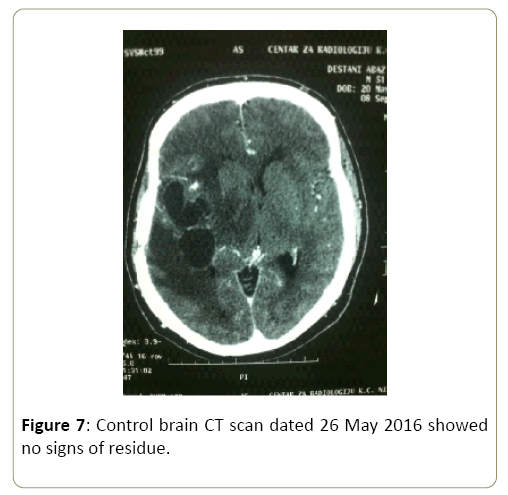 Figure 7: Control brain CT scan dated 26 May 2016 showed no signs of residue. PH finding was glioblastoma multiformed. No oncological treatment was performed. Due to the development of the repeated left-sided weakness, on 6 August 2016, a brain CT scan was performed showing signs of tumor change relapse (Figure 8). 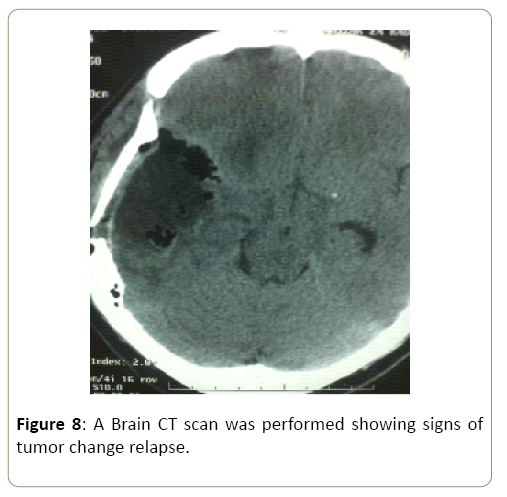 Figure 8: A Brain CT scan was performed showing signs of tumor change relapse. The patient was re-operated on 14 August 2016 Postoperatively stable. Control brain CT scan dated 17 August 2016 showed no presence of residue. Following a pathohistological glioblastoma diagnosis, the continuation of oncological treatment is mandatory. El- Serougy et al think that the combination of mean diffusivity of the solid tumoral part and of the peri-tumoral region is a noninvasive method to differentiate low-grade from highgrade gliomas . This includes the application of radiotherapy and chemotherapy. As for radiotherapy, today's standard "external beam radiotherapy" is the applied three-dimensional conformal radiotherapy with a tumor dose of 60 Gy in 30 sessions, 2 Gy daily, five days a week . Chemotherapy implies the use of one of the following preparations procarbazine, lomustine-CCNU, vincristine (PCV regimen), Carmustine-BCNU, Temozolomide. In a randomized Phase III study of the European and Canadian trial, it has been clearly demonstrated that the addition of temozolomide to radiotherapy, followed by six adjuvant temozolomide cycles, provides a significant benefit for survival . From 1966 to 1975, Brain Tumor Study Group compared a group of patients with only radiotherapy received and patients who in addition to radiotherapy underwent BCNU chemotherapy. The results showed that the survival time in the group that received BCNU therapy increased from 14 to about 35 months. Only adjuvant BCNU chemotherapy applied showed a slight increase in total survival of 18.5 months . The patient overview showed that in the case of nononcological treatment, glioblastoma relapse occurs within 3 months. • In patients treated for glioblastoma, despite maximum tumor reduction, non-application of oncological treatment results in tumor process relapse within 3 months. • Oncological treatment is a mandatory form of glioblastoma treatment and should begin as soon as possible. Chao ST, Hunter GK, Khan MK, Suh JH, Vogelbaum M (2009) Evidence -Based Adjuvant Therapy for Gliomas: Current Concept and Newer Developments. Indian Journal of Cancer 2: 96-107. Stupp R, Hegib ME, Wanner P, Mason VP (2009) Effect of Radiotherapy with Concomitant and Adjuvant Temozolomide versus Radiotherapy alone on Survival in Glioblastoma in a Randomised Phase Iii Study: 5-Years Analysis of The Eortc-Ncic Trial. The Lancet Oncology 5: 459-466. Razek AAKA, El-Serougy L, Abdelsalam M, Gaballa G, Talaat M (2017) Differentiation of Residual/Recurrent Gliomas from Postradiation Necrosis with Arterial Spin Labeling and Diffusion Tensor Magnetic Resonance Imaging-Derived Metrics. Neuroradiology 60: 169-177. Nikolov V, Stojanovic M, Kostic A, Radisavljevic M (2018) Factor Affecting the Survival of Patients with Glioblastoma Multiforme. 1: 173-178. El-Serougy L, Abdel Razek AA, Ezzat A, Eldawoody H, El-Morsy A (2916) Assessment of Diffusion Tensor Imaging Metrics in Differentiating Low-Grade From High-Grade Gliomas. Neuroradiol J 29: 400-407. Laperriener N, Zaura L, Cairncroos G (2002) Cancer Care Ontario Pratctice Guidelines Initiative Neuro-Oncology Diasise Site Group. Radiotherapu for Newly Diagnosed Malignant Glioma in Adults: A Sistematic Review. Radiother Oncol 64: 259-273. Stupp R, Mason VP, Van den Bentc MJ, Weller M (2005) Radiotherapu Plus Concomitant and Adjuvant Temozolamide for Glioblastoma. N Eng J Med 10: 987-996. Chao ST, Hunter GK, Khan MK, Suh JH, Vogelbaum M (2009) Evidence -Based Adjuvant Therapu for Gliomas: Current Concept and Newer Developments. Indijan Journal of Cancer 2: 96-107.